"NAFTA" redirects here. For other uses, see Nafta (disambiguation). The North American Free Trade Agreement (NAFTA; Spanish: Tratado de Libre Comercio de América del Norte, TLCAN; French: Accord de libre-échange nord-américain, ALÉNA) is an agreement signed by Canada, Mexico, and the United States, creating a trilateral trade bloc in North America. The agreement came into force on January 1, 1994. 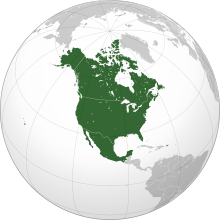 It superseded the 1988 Canada–United States Free Trade Agreement between the United States and Canada, and is expected to be replaced by the United States–Mexico–Canada Agreement once it is ratified. NAFTA has two supplements: the North American Agreement on Environmental Cooperation (NAAEC) and the North American Agreement on Labor Cooperation (NAALC). Most economic analyses indicate that NAFTA has been beneficial to the North American economies and the average citizen, but harmed a small minority of workers in industries exposed to trade competition. Economists hold that withdrawing from NAFTA or renegotiating NAFTA in a way that reestablishes trade barriers will adversely affect the U.S. economy and cost jobs. However, Mexico would be much more severely affected by job loss and reduction of economic growth in both the short term and long term. On September 30, 2018, it was announced that the United States, Mexico, and Canada had come to an agreement to replace NAFTA with the United States–Mexico–Canada Agreement (USMCA). The USMCA is the result of the renegotiation of NAFTA that the member states undertook from 2017 to 2018, though NAFTA will remain in force until the USMCA is ratified by its members. The impetus for a North American free trade zone began with U.S. President Ronald Reagan, who made the idea part of his campaign when he announced his candidacy for the presidency in November 1979. Canada and the United States signed the Canada–United States Free Trade Agreement (FTA) in 1988, and shortly afterward Mexican President Carlos Salinas de Gortari decided to approach US president George H. W. Bush to propose a similar agreement in an effort to bring in foreign investment following the Latin American debt crisis. As the two leaders began negotiating, the Canadian government under Prime Minister Brian Mulroney feared that the advantages Canada had gained through the Canada–US FTA would be undermined by a US–Mexican bilateral agreement, and asked to become a party to the US–Mexican talks. Back row, left to right: Mexican President Carlos Salinas de Gortari, U.S. President George H. W. Bush, and Canadian Prime Minister Brian Mulroney, at the initialing of the draft North American Free Trade Agreement in October 1992. In front are Mexican Secretary of Commerce and Industrial Development Jaime Serra Puche, United States Trade Representative Carla Hills, and Canadian Minister of International Trade Michael Wilson. The earlier Canada–United States Free Trade Agreement had been controversial and divisive in Canada, and featured as an issue in the 1988 Canadian election. In that election, more Canadians voted for anti-free trade parties (the Liberals and the New Democrats), but the split of the votes between the two parties meant that the pro-free trade Progressive Conservatives (PCs) came out of the election with the most seats and so took power. Mulroney and the PCs had a parliamentary majority and easily passed the 1987 Canada–US FTA and NAFTA bills. However, Mulroney was replaced as Conservative leader and prime minister by Kim Campbell. Campbell led the PC party into the 1993 election where they were decimated by the Liberal Party under Jean Chrétien, who campaigned on a promise to renegotiate or abrogate NAFTA. Chrétien subsequently negotiated two supplemental agreements with Bush, who had subverted the LAC advisory process and worked to "fast track" the signing prior to the end of his term, ran out of time and had to pass the required ratification and signing of the implementation law to incoming president Bill Clinton. Before sending it to the United States Senate Clinton added two side agreements, the North American Agreement on Labor Cooperation (NAALC) and the North American Agreement on Environmental Cooperation (NAAEC), to protect workers and the environment, and to also allay the concerns of many House members. The U.S. required its partners to adhere to environmental practices and regulations similar to its own. [citation needed] After much consideration and emotional discussion, the U.S. House of Representatives passed the North American Free Trade Agreement Implementation Act on November 17, 1993, 234–200. The agreement's supporters included 132 Republicans and 102 Democrats. The bill passed the Senate on November 20, 1993, 61–38. Senate supporters were 34 Republicans and 27 Democrats. Clinton signed it into law on December 8, 1993; the agreement went into effect on January 1, 1994. Clinton, while signing the NAFTA bill, stated that "NAFTA means jobs. American jobs, and good-paying American jobs. If I didn't believe that, I wouldn't support this agreement." NAFTA then replaced the previous Canada-US FTA. Bill Clinton's remarks on the signing of the North American Free Trade Agreement Implementation Act, December 8, 1993. The goal of NAFTA was to eliminate barriers to trade and investment between the U.S., Canada and Mexico. The implementation of NAFTA on January 1, 1994, brought the immediate elimination of tariffs on more than one-half of Mexico's exports to the U.S. and more than one-third of U.S. exports to Mexico. Within 10 years of the implementation of the agreement, all U.S.–Mexico tariffs were to be eliminated except for some U.S. agricultural exports to Mexico, to be phased out within 15 years. Most U.S.–Canada trade was already duty-free. NAFTA also sought to eliminate non-tariff trade barriers and to protect the intellectual property rights on traded products. Chapter 20 provides a procedure for the international resolution of disputes over the application and interpretation of NAFTA. It was modeled after Chapter 69 of the Canada–United States Free Trade Agreement. The roster of NAFTA adjudicators includes many retired judges, such as Alice Desjardins, John Maxwell Evans, Constance Hunt, John Richard, Arlin M. Adams, Susan Getzendanner, George C. Pratt, Charles B. Renfrew and Sandra Day O'Connor. The North American Free Trade Agreement Implementation Act made some changes to the copyright law of the United States, foreshadowing the Uruguay Round Agreements Act of 1994 by restoring copyright (within the NAFTA nations) on certain motion pictures which had entered the public domain. U.S. congressional approval for NAFTA would have been impossible without addressing public concerns about NAFTA's environmental impact. The Clinton administration negotiated a side agreement on the environment with Canada and Mexico, the North American Agreement on Environmental Cooperation (NAAEC), which led to the creation of the Commission for Environmental Cooperation (CEC) in 1994. To alleviate concerns that NAFTA, the first regional trade agreement between a developing country and two developed countries, would have negative environmental impacts, the commission was mandated to conduct ongoing ex post environmental assessment, It created one of the first ex post frameworks for environmental assessment of trade liberalization, designed to produce a body of evidence with respect to the initial hypotheses about NAFTA and the environment, such as the concern that NAFTA would create a "race to the bottom" in environmental regulation among the three countries, or that NAFTA would pressure governments to increase their environmental protections. The CEC has held[when?] four symposia to evaluate the environmental impacts of NAFTA and commissioned 47 papers on the subject from leading independent experts. NAFTA established the CANAMEX Corridor for road transport between Canada and Mexico, also proposed for use by rail, pipeline, and fiber optic telecommunications infrastructure. This became a High Priority Corridor under the U.S. Intermodal Surface Transportation Efficiency Act of 1991. In 2008, Canadian exports to the United States and Mexico were at $381.3 billion, with imports at $245.1 billion. According to a 2004 article by University of Toronto economist Daniel Trefler, NAFTA produced a significant net benefit to Canada in 2003, with long-term productivity increasing by up to 15 percent in industries that experienced the deepest tariff cuts. While the contraction of low-productivity plants reduced employment (up to 12 percent of existing positions), these job losses lasted less than a decade; overall, unemployment in Canada has fallen since the passage of the act. Commenting on this trade-off, Trefler said that the critical question in trade policy is to understand "how freer trade can be implemented in an industrialized economy in a way that recognizes both the long-run gains and the short-term adjustment costs borne by workers and others". A study in 2007 found that NAFTA had "a substantial impact on international trade volumes, but a modest effect on prices and welfare". According to a 2017 report by the New York City based public policy think tank report, Council on Foreign Relations (CFR), bilateral trade in agricultural products tripled in size from 1994 to 2017 and is considered to be one of the largest economic effects of NAFTA on U.S.-Canada trade with Canada becoming the U.S. agricultural sectors' leading importer. Canadian fears of losing manufacturing jobs to the United States did not materialize with manufacturing employment holding "steady". However, with Canada's labour productivity levels at 72% of U.S. levels, the hopes of closing the "productivity gap" between the two countries were also not realized. According to a 2018 Sierra Club report, Canada's commitments under NAFTA and the Paris agreement conflict. The Paris commitments are voluntary, and NAFTA's are compulsory. According to a 2018 report by Gordon Laxter published by the Council of Canadians, NAFTA's Article 605, energy proportionality rule ensures that Americans have "virtually unlimited first access to most of Canada's oil and natural gas" and Canada cannot reduce oil, natural gas and electricity exports (74% its oil and 52% its natural gas) to the U.S., even if Canada is experiencing shortages. These provisions that seemed logical when NAFTA was signed in 1993 are no longer appropriate. :4 The Council of Canadians promotes environmental protection and is against NAFTA's role in encouraging development of the tar sands and fracking. US President Donald Trump, angered by Canada's dairy tax of "almost 300%", threatened to leave Canada out of the NAFTA. Since 1972, Canada has been operating on a "supply management" system, which the United States is attempting to pressure it out of, specifically focusing on the dairy industry. However, this has not yet taken place, as Quebec, which holds approximately half the country's dairy farms, still supports supply management. Maquiladoras (Mexican assembly plants that take in imported components and produce goods for export) have become the landmark of trade in Mexico. They moved to Mexico from the United States[citation needed], hence the debate over the loss of American jobs. Income in the maquiladora sector has increased 15.5% since the implementation of NAFTA in 1994. Other sectors now benefit from the free trade agreement, and the share of exports to the U.S. from non-border states has increased in the last five years[when?] while the share of exports from border states has decreased. This has allowed rapid growth in non-border metropolitan areas such as Toluca, León and Puebla; all larger in population than Tijuana, Ciudad Juárez, and Reynosa. One of the most affected agricultural sectors is the meat industry. Mexico went from a small player in the pre-1994 U.S. export market to the second largest importer of U.S. agricultural products in 2004, and NAFTA may be a major catalyst for this change. Free trade removed the hurdles that impeded business between the two countries, so Mexico has provided a growing market for meat for the U.S., and increased sales and profits for the U.S. meat industry. A coinciding noticeable increase in the Mexican per capita GDP greatly changed meat consumption patterns; per capita meat consumption has grown. Production of corn in Mexico has increased since NAFTA. But internal demand for corn has increased beyond Mexico's supply, and imports have become needed, far beyond the quotas Mexico originally negotiated. Zahniser & Coyle also point out that corn prices in Mexico, adjusted for international prices, have drastically decreased, but through a program of subsidies expanded by former president Vicente Fox, production has remained stable since 2000. Reducing agricultural subsidies, especially corn subsidies, has been suggested as a way to reduce harm to Mexican farmers. A 2001 Journal of Economic Perspectives review of the existing literature found that NAFTA was a net benefit to Mexico. By the year 2003, 80% of the commerce in Mexico was executed only with the U.S. The commercial sales surplus, combined with the deficit with the rest of the world, created a dependency in Mexico's exports. These effects were evident in 2001–2003; the result of that recession was either a low rate or a negative rate in Mexico's exports. NAFTA has also been credited with the rise of the Mexican middle class. A Tufts University study found that NAFTA lowered the average cost of basic necessities in Mexico by up to 50%. This price reduction increased cash-on-hand for many Mexican families, allowing Mexico to graduate more engineers than Germany each year. Growth in new sales orders indicates an increase in demand for manufactured products, which resulted in expansion of production and a higher employment rate to satisfy the increment in the demand. The growth in the maquiladora industry and in the manufacturing industry was of 4.7% in August 2016. Three quarters of the imports and exports are with the U.S.
Tufts University political scientist Daniel W. Drezner has argued that NAFTA made it easier for Mexico to transform to a real democracy and become a country that views itself as North American. This has boosted cooperation between the United States and Mexico. In 2015, the Congressional Research Service concluded that the "net overall effect of NAFTA on the US economy appears to have been relatively modest, primarily because trade with Canada and Mexico accounts for a small percentage of US GDP. However, there were worker and firm adjustment costs as the three countries adjusted to more open trade and investment among their economies." The report also estimated that NAFTA added $80 billion to the US economy since its implementation, equivalent to a 0.5% increase in US GDP. The US Chamber of Commerce credits NAFTA with increasing U.S. trade in goods and services with Canada and Mexico from $337 billion in 1993 to $1.2 trillion in 2011, while the AFL–CIO blames the agreement for sending 700,000 American manufacturing jobs to Mexico over that time. University of California, San Diego economics professor Gordon Hanson has said that NAFTA helped the US compete against China and therefore saved US jobs. While some jobs were lost to Mexico as a result of NAFTA, considerably more would have been lost to China if not for NAFTA. The US had a trade surplus with NAFTA countries of $28.3 billion for services in 2009 and a trade deficit of $94.6 billion (36.4% annual increase) for goods in 2010. This trade deficit accounted for 26.8% of all US goods trade deficit. A 2018 study of global trade published by the Center for International Relations identified irregularities in the patterns of trade of NAFTA ecosystem using network theory analytical techniques. The study showed that the US trade balance is influenced by tax avoidance opportunities provided in Ireland. A study published in the August 2008 issue of the American Journal of Agricultural Economics, found NAFTA increased US agricultural exports to Mexico and Canada, even though most of the increase occurred a decade after its ratification. The study focused on the effects that gradual "phase-in" periods in regional trade agreements, including NAFTA, have on trade flows. Most of the increase in members' agricultural trade, which was only recently brought under the purview of the World Trade Organization, was due to very high trade barriers before NAFTA or other regional trade agreements. The U.S. foreign direct investment (FDI) in NAFTA countries (stock) was $327.5 billion in 2009 (latest data available)[when? ], up 8.8% from 2008. The US direct investment in NAFTA countries is in nonbank holding companies, and in the manufacturing, finance/insurance, and mining sectors. The foreign direct investment of Canada and Mexico in the United States (stock) was $237.2 billion in 2009 (the latest data available), up 16.5% from 2008. Many American small businesses depend on exporting their products to Canada or Mexico under NAFTA. According to the U.S. Trade Representative, this trade supports over 140,000 small- and medium-sized businesses in the US. According to University of California Berkeley professor of economics Brad DeLong, NAFTA had an insignificant impact on US manufacturing. The adverse impact on manufacturing has been exaggerated in US political discourse according to DeLong, and Harvard economist Dani Rodrik. According to a 2013 article by Jeff Faux published by the Economic Policy Institute, California, Texas, Michigan and other states with high concentrations of manufacturing jobs were most affected by job loss due to NAFTA. According to a 2011 article by EPI economist Robert Scott about 682,900 U.S. jobs were "lost or displaced" as a result of the trade agreement. More recent studies agree with reports by the Congressional Research Service, that NAFTA only had a modest impact on manufacturing employment, and that automation explains 87% of the losses in manufacturing jobs. According to a study in the Journal of International Economics, NAFTA reduced pollution emitted by the US manufacturing sector: "On average, nearly two-thirds of the reductions in PM10[clarification needed] and SO2[clarification needed] emissions from the U.S. manufacturing sector between 1994 and 1998 can be attributed to trade liberalization following NAFTA." According to the Sierra Club, NAFTA contributed to large-scale, export-oriented farming, which led to the increased use of fossil fuels, pesticides and GMO. NAFTA also contributed to environmentally destructive mining practices in Mexico. It prevented Canada from effectively regulating its tar sands industry, and created new legal avenues for transnational corporations to fight environmental legislation. In some cases, environmental policy was neglected in the wake of trade liberalization; in other cases, NAFTA's measures for investment protection, such as Chapter 11, and measures against non-tariff trade barriers threatened to discourage more vigorous environmental policy. The most serious overall increases in pollution due to NAFTA were found in the base metals sector, the Mexican petroleum sector, and the transportation equipment sector in the United States and Mexico, but not in Canada. According to the Department of Homeland Security Yearbook of Immigration Statistics, during fiscal year 2006 (i.e., October 2005 through September 2006), 73,880 foreign professionals (64,633 Canadians and 9,247 Mexicans) were admitted into the United States for temporary employment under NAFTA (i.e., in the TN status). Additionally, 17,321 of their family members (13,136 Canadians, 2,904 Mexicans, as well as a number of third-country nationals married to Canadians and Mexicans) entered the U.S. in the treaty national's dependent (TD) status. Because DHS counts the number of the new I-94 arrival records filled at the border, and the TN-1 admission is valid for three years, the number of non-immigrants in TN status present in the U.S. at the end of the fiscal year is approximately equal to the number of admissions during the year. (A discrepancy may be caused by some TN entrants leaving the country or changing status before their three-year admission period has expired, while other immigrants admitted earlier may change their status to TN or TD, or extend TN status granted earlier). We have got to stop sending jobs overseas. It's pretty simple: If you're paying $12, $13, $14 an hour for factory workers and you can move your factory south of the border, pay a dollar an hour for labor, ... have no health care—that's the most expensive single element in making a car—have no environmental controls, no pollution controls and no retirement, and you don't care about anything but making money, there will be a giant sucking sound going south. Perot ultimately lost the election, and the winner, Bill Clinton, supported NAFTA, which went into effect on January 1, 1994. In 1996, the gasoline additive MMT was brought to Canada by Ethyl Corporation, an American company when the Canadian federal government banned imports of the additive. The American company brought a claim under NAFTA Chapter 11 seeking US$201 million, from the Canadian federal government as well as the Canadian provinces under the Agreement on Internal Trade (AIT). They argued that the additive had not been conclusively linked to any health dangers, and that the prohibition was damaging to their company. Following a finding that the ban was a violation of the AIT, the Canadian federal government repealed the ban and settled with the American company for US$13 million. Studies by Health and Welfare Canada (now Health Canada) on the health effects of MMT in fuel found no significant health effects associated with exposure to these exhaust emissions. Other Canadian researchers and the U.S. Environmental Protection Agency disagreed citing studies that suggested possible nerve damage. The United States and Canada have argued for years over the United States' 27% duty on Canadian softwood lumber imports. Canada filed many motions to have the duty eliminated and the collected duties returned to Canada. After the United States lost an appeal before a NAFTA panel, it responded by saying "We are, of course, disappointed with the [NAFTA panel's] decision, but it will have no impact on the anti-dumping and countervailing duty orders." (spokesman for U.S. Trade Representative Rob Portman) On July 21, 2006, the United States Court of International Trade found that imposition of the duties was contrary to U.S. law. On October 30, 2007, American citizens Marvin and Elaine Gottlieb filed a Notice of Intent to Submit a Claim to Arbitration under NAFTA, claiming thousands of U.S. investors lost a total of $5 billion in the fall-out from the Conservative Government's decision the previous year to change the tax rate on income trusts in the energy sector. On April 29, 2009, a determination was made that this change in tax law was not expropriation. Several studies have rejected NAFTA responsibility for depressing the incomes of poor corn farmers. The trend existed more than a decade before NAFTA existed. Also, maize production increased after 1994, and there wasn't a measurable impact on the price of Mexican corn because of subsidized[who?] corn from the United States. The studies agreed that the abolition of U.S. agricultural subsidies would benefit Mexican farmers. Preparations for NAFTA included cancellation of Article 27 of Mexico's constitution, the cornerstone of Emiliano Zapata's revolution in 1910–1919. Under the historic Article 27, indigenous communal landholdings were protected from sale or privatization. However, this barrier to investment was incompatible with NAFTA. Indigenous farmers feared the loss of their remaining lands, and also feared cheap imports (substitutes) from the US. The Zapatistas labelled NAFTA a "death sentence" to indigenous communities all over Mexico. Then EZLN declared war on the Mexican state on January 1, 1994, the day NAFTA came into force. Another contentious issue is the investor-state dispute settlement obligations contained in Chapter 11 of NAFTA. Chapter 11 allows corporations or individuals to sue Mexico, Canada or the United States for compensation when actions taken by those governments (or by those for whom they are responsible at international law, such as provincial, state, or municipal governments) violate international law. Methanex Corporation, a Canadian corporation, filed a US$970 million suit against the United States because, it said, a California ban on Methyl tert-butyl ether (MTBE), a substance that had found its way into many wells in the state, was hurtful to the corporation's sales of methanol. The claim was rejected, and the company was ordered to pay US$3 million to the U.S. government in costs, based on the following reasoning: "But as a matter of general international law, a non-discriminatory regulation for a public purpose, which is enacted in accordance with due process and, which affects, inter alios, a foreign investor or investment is not deemed expropriatory and compensable unless specific commitments had been given by the regulating government to the then putative foreign investor contemplating investment that the government would refrain from such regulation." In another case, Metalclad, an American corporation, was awarded US$15.6 million from Mexico after a Mexican municipality refused a construction permit for the hazardous waste landfill it intended to construct in Guadalcázar, San Luis Potosí. The construction had already been approved by the federal government with various environmental requirements imposed (see paragraph 48 of the tribunal decision). The NAFTA panel found that the municipality did not have the authority to ban construction on the basis of its environmental concerns. In Eli Lilly and Company v. Government of Canada the plaintiff presented a US$500 million claim for the way Canada requires usefulness in its drug patent legislation. Apotex is sued the U.S. for US$520 million because of opportunity it says it lost in an FDA generic drug decision. Lone Pine Resources Inc. v. Government of Canada filed a US$250 million claim against Canada, accusing it of "arbitrary, capricious and illegal" behaviour, because Quebec intends to prevent fracking exploration under the St. Lawrence Seaway. Milos Barutciski, the lawyer for Lone Pine, has decried portrayals of his client as "another rapacious multinational challenging governments' ability to regulate for health, safety and the environment". Lone Pine Resources is incorporated in Delaware but headquartered in Calgary, and had an initial public offering on the NYSE May 25, 2011, of 15 million shares each for $13, which raised US$195 million. Barutciski acknowledged "that NAFTA and other investor-protection treaties create an anomaly in that Canadian companies that have also seen their permits rescinded by the very same Quebec legislation, which expressly forbids the paying of compensation, do not have the right (to) pursue a NAFTA claim", and that winning "compensation in Canadian courts for domestic companies in this case would be more difficult since the Constitution puts property rights in provincial hands". A treaty[clarification needed] with China would extend similar rights to Chinese investors, including SOEs. A Chapter 19 panel is expected to examine whether the agency's determination is supported by "substantial evidence". This standard assumes significant deference to the domestic agency. Some of the most controversial trade disputes in recent years, such as the U.S.–Canada softwood lumber dispute, have been litigated before Chapter 19 panels. In a 60 Minutes interview in September 2015, 2016 presidential candidate Donald Trump called NAFTA "the single worst trade deal ever approved in [the United States]", and said that if elected, he would "either renegotiate it, or we will break it". Juan Pablo Castañón [es], president of the trade group Consejo Coordinador Empresarial, expressed concern about renegotiation and the willingness to focus on the car industry. A range of trade experts have said that pulling out of NAFTA would have a range of unintended consequences for the United States, including reduced access to its biggest export markets, a reduction in economic growth, and higher prices for gasoline, cars, fruits, and vegetables. Members of the private initiative in Mexico noted that to eliminate NAFTA, many laws must be adapted by the U.S. Congress. The move would also eventually result in legal complaints by the World Trade Organization. The Washington Post noted that a Congressional Research Service review of academic literature concluded that the "net overall effect of NAFTA on the U.S. economy appears to have been relatively modest, primarily because trade with Canada and Mexico accounts for a small percentage of U.S. GDP". Democratic candidate Bernie Sanders, opposing the Trans-Pacific Partnership trade agreement, called it "a continuation of other disastrous trade agreements, like NAFTA, CAFTA, and permanent normal trade relations with China". He believes that free trade agreements have caused a loss of American jobs and depressed American wages. Sanders has said that America needs to rebuild its manufacturing base using American factories for well-paying jobs for American labor rather than outsourcing to China and elsewhere. Shortly after his election, U.S. President Donald Trump said he would begin renegotiating the terms of NAFTA, to resolve trade issues he had campaigned on. The leaders of Canada and Mexico have indicated their willingness to work with the Trump administration. Although vague on the exact terms he seeks in a renegotiated NAFTA, Trump threatened to withdraw from it if negotiations fail. According to Chad Bown of the Peterson Institute for International Economics, the Trump administration's list "is very consistent with the president's stance on liking trade barriers, liking protectionism. This makes NAFTA in many respects less of a free-trade agreement." The concerns expressed by the US Trade Representative over subsidized state-owned enterprises and currency manipulation are not thought to apply to Canada and Mexico, but rather to be designed to send a message to countries beyond North America. Jeffrey Schott of the Peterson Institute for International Economics noted that it would not be possible to conclude renegotiations quickly while also addressing all the concerns on the list. He also said that it would be difficult to do anything about trade deficits. An October 2017 op-ed in Toronto's The Globe and Mail questioned whether the United States wanted to re-negotiate the agreement or planned to walk away from it no matter what, noting that newly appointed American ambassador Kelly Knight Craft is married to the owner of Alliance Resource Partners, a big US coal operation. Canada is implementing a carbon plan, and there is also the matter of a sale of Bombardier jets. "The Americans inserted so many poison pills into last week's talks in Washington that they should have been charged with murder", wrote the columnist, John Ibbitson. "A number of the proposals that the United States has put on the table have little or no support from the U.S. business and agriculture community. It isn't clear who they're intended to benefit", said John Murphy, vice-president of the U.S. Chamber of Commerce. Pat Roberts, the senior US senator from Kansas, called for an outcry against Trump anti-NAFTA moves, saying the "issues affect real jobs, real lives and real people". Kansas is a major agricultural exporter, and farm groups warn that just threatening to leave NAFTA might cause buyers to minimize uncertainty by seeking out non-US sources. A fourth round of talks included a U.S. demand for a sunset clause that would end the agreement in five years, unless the three countries agreed to keep it in place, a provision U.S. Commerce Secretary Wilbur Ross has said would allow the countries to kill the deal if it was not working. Canadian Prime Minister Justin Trudeau met with the House Ways and Means Committee, since Congress would have to pass legislation rolling back the treaty's provisions if Trump tries to withdraw from the pact. From June to late August 2018, Canada was sidelined as the United States and Mexico held bilateral talks. On 27 August 2018 Mexico and the United States announced they had reached a bilateral understanding on a revamped NAFTA trade deal that included provisions that would boost automobile production in the U.S., a 10-year data protection period against generic drug production on an expanded list of products that benefits pharmaceutical companies, particularly US makers producers of high-cost biologic drugs, a sunset clause—a 16-year expiration date with regular 6-year reviews to possibly renew the agreement for additional 16-year terms, and an increased de minimis threshold in which Mexico raised the de minimis value to $100 from $50 regarding online duty- and tax-free purchases. According to an August 30 article in The Economist, Mexico agreed to increase the rules of origin threshold which would mean that 75% as opposed to the previous 62.5% of a vehicle's components must be made in North America to avoid tariffs. Since car makers currently import less expensive components from Asia, under the revised agreement, consumers would pay more for vehicles. As well, approximately 40 to 45 per cent of vehicle components must be made by workers earning a minimum of US$16 per hour, in contrast to the current US$2.30 an hour that a worker earns on average in a Mexican car manufacturing plant. The Economist described this as placing "Mexican carmaking into a straitjacket". Trudeau and Canadian Foreign Minister Chrystia Freeland announced that they were willing to join the agreement if it was in Canada's interests. Freeland returned from her European diplomatic tour early, cancelling a planned visit to Ukraine, to participate in NAFTA negotiations in Washington, D.C. in late August. According to an August 31 Canadian Press published in the Ottawa Citizen, key issues under debate included supply management, Chapter 19, pharmaceuticals, cultural exemption, the sunset clause, and de minimis thresholds. Following Donald Trump's election to the presidency, a range of trade experts have said that pulling out of NAFTA as Trump proposed would have a range of unintended consequences for the U.S., including reduced access to the U.S.'s biggest export markets, a reduction in economic growth, and increased prices for gasoline, cars, fruits, and vegetables. The worst affected sectors would be textiles, agriculture and automobiles. According to Tufts University political scientist Daniel W. Drezner, the Trump administration's desire to return relations with Mexico to the pre-NAFTA era are misguided. Drezner argues that NAFTA made it easier for Mexico to transform to a real democracy and become a country that views itself as North American. If Trump acts on many of the threats that he has made against Mexico, it is not inconceivable that Mexicans would turn to left-wing populist strongmen, as several South American countries have. At the very least, US-Mexico relations would worsen, with adverse implications for cooperation on border security, counterterrorism, drug-war operations, deportations and managing Central American migration. According to Chad P. Bown (senior fellow at the Peterson Institute for International Economics), "a renegotiated NAFTA that would reestablish trade barriers is unlikely to help workers who lost their jobs—regardless of the cause—take advantage of new employment opportunities". If the original Trans-Pacific Partnership (TPP) had come into effect, existing agreements such as NAFTA would be reduced to those provisions that do not conflict with the TPP, or that require greater trade liberalization than the TPP. However, only Canada and Mexico will have the prospect of becoming members of the TPP after U.S. President Donald Trump withdrew the United States from the agreement in January 2017. In May 2017, the 11 remaining members of the TPP, including Canada and Mexico, agreed to proceed with a revised version of the trade deal without U.S. participation. ^ NAFTA Secretariat Archived April 12, 2013, at the Wayback Machine. Nafta-sec-alena.org (June 9, 2010). Retrieved on July 12, 2013. ^ "Report for Selected Countries and Subjects". Retrieved September 5, 2017. ^ "Free Trade Agreements". Office of the United States Trade Representative. Retrieved 2016-08-23. ^ "Canada-United States Free Trade Agreement (FTA)". Foreign Affairs, Trade, and Development Canada. Archived from the original on December 6, 2014. Retrieved December 3, 2014. ^ "Trump Clinches Rebranded Nafta as Canada Joins Pact With Mexico" Retrieved on 1 October 2018. ^ "NAFTA's Economic Impact". Council on Foreign Relations. Retrieved 2017-07-18. ^ a b "Poll Results | IGM Forum". www.igmchicago.org. 13 March 2012. Retrieved 2016-01-01. ^ Hiltzik, Michael (January 30, 2017). "NAFTA doesn't count for much economically, but it's still a huge political football. Here's why". Los Angeles Times. ISSN 0458-3035. Retrieved July 18, 2017. ^ a b c "Driving Home the Importance of NAFTA | Econofact". Econofact. Retrieved 2017-02-15. ^ a b Eric Martin, Trump Killing Nafta Could Mean Big Unintended Consequences for the U.S., Bloomberg Business (October 1, 2015). ^ a b "Which American producers would suffer from ending NAFTA?". The Economist. Retrieved 2017-02-19. ^ "Nafta withdrawal would hit US GDP without helping trade deficit – report". Financial Times. ^ "United States-Mexico-Canada Agreement". USTR. Retrieved October 1, 2018. ^ a b "North American Free Trade Agreement (NAFTA)". The Canadian Encyclopedia. Historica Canada. Retrieved 19 November 2017. ^ Labor Advisory Committee for Trade Negotiations and Trade Policy; established under the Trade Act of 1974. ^ Preliminary Report of the Labor Advisory Committee for Trade Negotiations and Trade Policy on the North American Free Trade Agreement, dated Sept. 16, 1992 (Washington, D.C.: Executive Office of the President, Office of the U.S. Trade Representative, 1992), i, 1. ^ For an overview of the process, see Noam Chomsky, "'Mandate for Change', or Business as Usual", Z Magazine 6, no. 2 (February 1993), 41. ^ "H.R.3450 – North American Free Trade Agreement Implementation Act". Retrieved December 29, 2014. ^ "Clinton Signs NAFTA – December 8, 1993". Miller Center. University of Virginia. Archived from the original on October 10, 2010. Retrieved January 27, 2011. ^ "NAFTA Timeline". Fina-nafi. Archived from the original on January 14, 2011. Retrieved July 4, 2011. ^ "Pest Management Regulatory Agency". Health Canada. Branches and Agencies. nd. Retrieved September 3, 2018. ^ Rothbard, Murray. "The NAFTA Myth". Mises Institute. Mises Institute. Retrieved 18 March 2016. ^ "Trade and Environment in the Americas". Cec.org. Retrieved November 9, 2008. ^ "NAFTA – Fast Facts: North American Free Trade Agreement". NAFTANow.org. April 4, 2012. Retrieved October 26, 2013. ^ Trefler, Daniel (Sep 2004). "The Long and Short of the Canada-U.S. Free Trade Agreement" (PDF). American Economic Review. 94 (4): 870–895. doi:10.1257/0002828042002633. ^ Bernstein, William J. (16 May 2009). A Splendid Exchange: How Trade Shaped the World. Grove Press. ^ a b c d e Caliendo, Lorenzo; Parro, Fernando (2015-01-01). "Estimates of the Trade and Welfare Effects of NAFTA". The Review of Economic Studies. 82 (1): 1–44. CiteSeerX 10.1.1.189.1365. doi:10.1093/restud/rdu035. ISSN 0034-6527. ^ a b McBride, James; Sergie, Mohammed Aly (2017) [February 14, 2014]. "NAFTA's Economic Impact". Council on Foreign Relations (CFR) think tank. Retrieved September 3, 2018. ^ "NAFTA and Climate Report 2018" (PDF). Sierra Club. ^ a b Laxer, Gordon. "Escaping Mandatory Oil Exports: Why Canada needs to dump NAFTA's energy proportionality rule" (PDF). p. 28. ^ a b "The coddling of the Canadian cow farmer". The Economist. Retrieved 2018-09-12. ^ "Clark, Georgia Rae. 2006. Analysis of Mexican demand for Meat: A Post-NAFTA Demand Systems Approach. MS Thesis, Texas Tech University" (PDF). Archived from the original (PDF) on August 15, 2011. Retrieved July 4, 2011. ^ Steven S. Zahniser & William T. Coyle, U.S.-Mexico Corn Trade During the NAFTA Era: New Twists to an Old Story, Outlook Report No. FDS04D01 (Economic Research Service/USDA, May 2004), 22 pp. ^ H, Hanson, Gordon (2007-03-09). "Globalization, Labor Income, and Poverty in Mexico". ^ O'Neil, Shannon (March 2013). "Mexico Makes It". Foreign Affairs. 92 (2). Retrieved 19 March 2016. ^ Taylor, Guy (14 May 2012). "NAFTA key to economic, social growth in Mexico". www.washingtontimes.com. The Washington Times. Retrieved 19 March 2016. ^ a b "The missing dimension in the NAFTA debate". Washington Post. Retrieved 2017-02-12. ^ https://www.facebook.com/anaclaireswanson. "Trump administration formally launches NAFTA renegotiation". Washington Post. Retrieved 2017-07-18. ^ Frankel, Jeffrey (2017-04-24). "How to Renegotiate NAFTA". Project Syndicate. Retrieved 2017-07-18. ^ "The effects of NAFTA on US trade, jobs, and investment, 1993-2013". ^ "Contentious Nafta pact continues to generate a sparky debate". Retrieved January 20, 2017. ^ a b "NAFTA's Economic Impact". Council on Foreign Relations. Retrieved 2017-02-07. ^ a b Porter, Eduardo (2016-03-29). "Nafta May Have Saved Many Autoworkers' Jobs". The New York Times. ISSN 0362-4331. Retrieved 2017-02-07. ^ a b c d "North American Free Trade Agreement (NAFTA)". Office of the United States Trade Representative. Retrieved December 3, 2014. ^ Lavassani, Kayvan (June 2018). "Data Science Reveals NAFTA's Problem" (PDF). International Affairs Forum (June 2018). Center for International Relations. Retrieved 7 July 2018. ^ "Free Trade Agreement Helped U.S. Farmers". Newswise. Retrieved on June 12, 2008. ^ Villarreal, M. Angeles; Fergusson, Ian F. (May 24, 2017). The North American Free Trade Agreement (PDF). Congressional Research Service (CRS) (Report). Retrieved September 2, 2018. ^ "North American Free Trade Agreement (NAFTA) | United States Trade Representative". ustr.gov. Retrieved 2016-10-12. ^ a b DeLong, J. Bradford. "NAFTA and other trade deals have not gutted American manufacturing – period". Vox. Retrieved 2017-02-07. ^ "What did NAFTA really do?". Dani Rodrik's weblog. Retrieved 2017-02-07. ^ Faux, Jeff (December 9, 2013). "NAFTA's Impact on U.S. Workers". Economic Policy Institute. Retrieved 2016-10-12. ^ "U.S. Economy Lost Nearly 700,000 Jobs Because Of NAFTA, EPI Says". The Huffington Post. July 12, 2011. ^ Long, Heather (February 16, 2017). "U.S. auto workers hate NAFTA ... but love robots". CNNMoney. Retrieved 2017-02-21. The problem, they argue, is that machines took over. One study by Ball State University says 87% of American manufacturing jobs have been lost to robots. Only 13% have disappeared because of trade ... But workers in Michigan think the experts have it wrong. ^ a b c "Environmental Damages Underscore Risks of Unfair Trade". Sierraclub.org. Retrieved March 4, 2014. ^ "IngentaConnect NAFTA Commission for Environmental Cooperation: ongoing assessment of trade liberalization in North America". Ingentaconnect.com. Archived from the original on June 6, 2011. Retrieved November 9, 2008. ^ Bacon, David. "Globalization and NAFTA Caused Migration from Mexico | Political Research Associates". Retrieved 2017-04-03. ^ "Facts and Figures 2006 – Immigration Overview: Permanent and Temporary Residents". Cic.gc.ca. June 29, 2007. Archived from the original on August 22, 2008. Retrieved November 9, 2008. ^ "THE 1992 CAMPAIGN; Transcript of 2d TV Debate Between Bush, Clinton and Perot". The New York Times. New York Times Company. 16 October 1992. Retrieved 16 May 2016. ^ "Dispute Settlement". Dfait-maeci.gc.ca. October 15, 2010. Archived from the original on January 15, 2008. Retrieved July 4, 2011. ^ "MMT: the controversy over this fuel additive continues". canadiandriver.com. Retrieved July 4, 2011. ^ Canada, Global Affairs; Canada, Affaires mondiales (June 26, 2013). "Global Affairs Canada". Archived from the original on December 27, 2007. Retrieved January 20, 2017. ^ Fiess, Norbert; Daniel Lederman (November 24, 2004). "Mexican Corn: The Effects of NAFTA" (PDF). Trade Note. The World Bank Group. 18. Archived from the original (PDF) on June 16, 2007. Retrieved March 12, 2007. ^ "NAFTA, Chapter 11". Sice.oas.org. Retrieved July 4, 2011. ^ Government of Canada, Global Affairs Canada (July 31, 2002). "The North American Free Trade Agreement (NAFTA) – Chapter 11 – Investment". Retrieved January 20, 2017. ^ "'North American Free Trade Agreement (NAFTA)', Public Citizen". Citizen.org. January 1, 1994. Retrieved July 4, 2011. ^ Red Mexicana de Accion Frente al Libre Comercio. "NAFTA and the Mexican Environment". Archived from the original on December 16, 2000. ^ "The Council of Canadians". Canadians.org. Retrieved July 4, 2011. ^ Commission for Environmental Cooperation. "The NAFTA environmental agreement: The Intersection of Trade and the Environment". Cec.org. Archived from the original on June 11, 2007. Retrieved July 4, 2011. ^ PEJ News. "Judge Rebuffs Challenge to NAFTA'S Chapter 11 Investor Claims Process". Pej.org. Archived from the original on July 26, 2011. Retrieved July 4, 2011. ^ Government of Canada, Foreign Affairs Trade and Development Canada. "Eli Lilly and Company v. Government of Canada". Retrieved January 20, 2017. ^ a b c "Canada must learn from NAFTA legal battles". Retrieved January 20, 2017. ^ Government of Canada, Foreign Affairs Trade and Development Canada. "Lone Pine Resources Inc. v. Government of Canada". Retrieved January 20, 2017. ^ a b c d "Quebec's St. Lawrence fracking ban challenged under NAFTA". Retrieved January 20, 2017. ^ "Stock:Lone Pine Resources". Retrieved January 20, 2017. ^ a b c Millán, Juan. "North American Free Trade Agreement; Invitation for Applications for Inclusion on the Chapter 19 Roster" (PDF). Federal Register. Office of the United States Trade Representative. Retrieved 19 March 2016. ^ Politico Staff. "Full transcript: First 2016 presidential debate". Politico. Retrieved 27 September 2016. ^ Jill Colvin, Trump: NAFTA trade deal a 'disaster,' says he'd 'break' it, Associated Press (September 25, 2015). ^ Mark Thoma, Is Donald Trump right to call NAFTA a "disaster"?, CBS News (October 5, 2015). ^ a b Gonzales, Lilia (November 14, 2016). "El Economista". ^ Eric Martin, Trump Killing NAFTA Could Mean Big Unintended Consequences for the U.S., Bloomberg Business (October 1, 2015). ^ Sanders, Bernie (May 21, 2015). "The TPP Must Be Defeated". The Huffington Post. Retrieved May 22, 2015. ^ "Canada, Mexico talked before making NAFTA overture to Trump". Retrieved April 3, 2018. ^ "What Is Nafta, and How Might Trump Change It?". The New York Times. Retrieved April 5, 2017. ^ a b c d e f Rappeport, Alan (2017-07-17). "U.S. Calls for 'Much Better Deal' in Nafta Overhaul Plan". The New York Times. ISSN 0362-4331. Retrieved 2017-07-18. ^ "U.S. makes lower trade deficit top priority in NAFTA talks". Reuters. July 18, 2017. Retrieved 2017-07-18. ^ a b c "US calls for smaller deficits in new NAFTA talks". BBC News. 2017-07-18. Retrieved 2017-07-18. ^ Lee, Don (August 27, 2018). "U.S. and Mexico strike preliminary accord on NAFTA; Canada expected to return to bargaining table". Los Angeles Times. Retrieved August 27, 2018. ^ "Trump Reaches Revised Trade Deal With Mexico, Threatening to Leave Out Canada". The New York Times. August 27, 2018. Retrieved September 30, 2018. ^ a b "NAFTA's sticking points: Key hurdles to clear on the way to a deal". The Ottawa Citizen via Canadian Press. Ottawa, Ontario. August 30, 2018. Retrieved September 2, 2018. ^ "Trump announces 'incredible' trade deal with Mexico". BBC News. 27 August 2018. Retrieved September 2, 2018. ^ a b Villarreal, M. Angeles; Fergusson, Ian F. (July 26, 2018). NAFTA Renegotiation and Modernization (PDF). Congressional Research Service (CRS) (Report). p. 47. Retrieved September 2, 2018. ^ "Trump: Canada 'will be out' of trade deal unless it's 'fair'". BBC. September 2, 2018. Retrieved September 2, 2018. ^ Aleem, Zeeshan (October 26, 2017). "We asked 6 experts if Congress could stop Trump from eliminating NAFTA". VOX. Retrieved September 2, 2018. ^ "Donald Trump threatens to cancel NAFTA entirely if Congress interferes with his plans". Edmonton Journal. September 2, 2018. Retrieved September 2, 2018. ^ "Renegotiated NAFTA Likely to Require Congressional Approval, CRS Says". Sandler, Travis & Rosenberg Trade Report. February 1, 2017. Retrieved September 2, 2018. ^ "US and Canada reach deal on NAFTA". CNN. September 30, 2018. Retrieved September 30, 2018. ^ "U.S. and Canada Reach Deal to Salvage Nafta". The New York Times. September 30, 2018. Retrieved September 30, 2018. ^ Journal, Julie Wernau | Photographs by Mark Mahaney for The Wall Street (2017-02-12). "Denim Dilemma". Wall Street Journal. ISSN 0099-9660. Retrieved 2017-02-12. ^ "What is NAFTA, and what would happen to U.S. trade without it?". Washington Post. Retrieved 2017-02-15. ^ Isfeld, Gordon (12 October 2015). "Forget NAFTA, the TPP is the new 'gold standard' of global trade". Financial Post. National Post. Retrieved 31 December 2015. ^ Shaffer, Sri Jegarajah, Craig Dale, Leslie (2017-05-21). "TPP nations agree to pursue trade deal without US". CNBC. Retrieved July 4, 2017. ^ a b Inc., Gallup,. "Americans Split on Whether NAFTA Is Good or Bad for U.S." Gallup.com. Retrieved 2018-04-30. ^ "Redirecting ..." heinonline.org. Retrieved 2018-04-30. ^ "Transcript of the First Debate". The New York Times. 2016-09-27. ISSN 0362-4331. Retrieved 2018-04-30. ^ a b Affairs, Chicago Council on Global. "Pro-Trade Views on the Rise, Partisan Divisions on NAFTA Widen | Chicago Council on Global Affairs". www.thechicagocouncil.org. Retrieved 2018-04-30. ^ Inc., Gallup,. "Opinion Briefing: North American Free Trade Agreement". Gallup.com. Retrieved 2018-04-30. Maxwell A. Cameron, Brian W. Tomlin (2002) The making of NAFTA: how the deal was done. Cornell University Press. ISBN 0-8014-8781-1. Poynter. 2018. Everything you should know about North American trade, in 8 fact checks. Wikimedia Commons has media related to North American Free Trade Agreement. Text of the agreement, on the official website of the NAFTA Secretariat. Abbott, Frederick M. North American Free Trade Agreement, Case Law (Max Planck Encyclopedia of Public International Law).